Vitamin C+ Cream contains a stabilized form of Vitamin C to counteract wrinkle formation, brighten age spots along with blending rich emollients in this cream to nourish the skin. Vitamin C is essential for overall skin health and radiant appearance. By applying topical Vitamin C skincare, the skin is able to combat wrinkles and age spots caused by the sun and environmental pollutants. Vitamin C is critical for the body and also plays an important role in skin maintenance and protection. 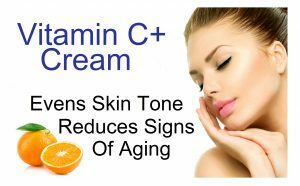 The Vitamin C+ Cream from Ageless Solutions contains a stabilized form of Vitamin C to provide treatment for current signs of aging while offering antioxidant protection from further damage. Vitamin C is well known for its ability to seek out areas of uneven tone on the surface of skin caused by aging and improve its appearance. Ageless Solutions Vitamin C+ Cream is an excellent all-purpose product to achieve hydrated skin and multiple anti-aging benefits.